Isotonic exercises work muscle groups through joint movement. Shoulder isotonic exercises, therefore, move the shoulder joint to work the surrounding muscles. There are numerous exercises you may already perform that can be described as isotonic exercises for the shoulder. All of these exercises can be performed using dumbbells; you can also perform some using resistance bands, barbells or cables and pulleys. Use a weight that allows you to work your muscles to fatigue, but do not exceed your known level of performance. 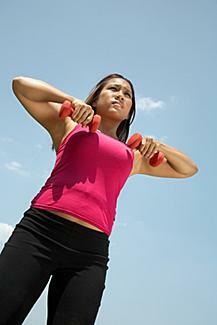 You can do shoulder raises using dumbbells, resistance bands or barbells. They work the anterior and medial deltoids, as well as the traps and triceps. Sit upright on a chair or bench that has back support. Hold the weight or weights level to your chin with your elbows bent. 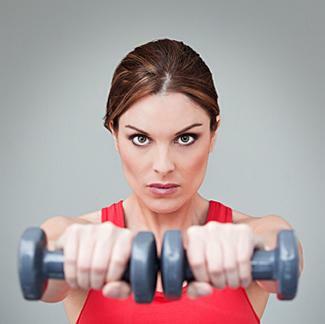 Press the weight straight upward until your arms are straight, but your elbows are not locked. Pause briefly and lower to chin level. Front raises are done using dumbbells or resistance bands. They work the anterior deltoids; begin this exercise with a lighter weight and build up slowly to avoid injury. Stand upright with your feet shoulder-width apart and knees slightly bent. Hold the weights to either side with your arms straight. Raise your arms directly out in front of you without bending your elbows. Lateral raises are also done with either dumbbells or resistance bands. They work the lateral, or side, deltoid muscles. Hold the weights at your sides with your arms straight but elbows unlocked. Raise the weights equally out to either side until they are shoulder height. Rear raises are performed using dumbbells. They work the posterior deltoid muscles. Stand with your feet hip-distance apart and knees slightly bent. Bend over at the waist so your upper body is parallel to the ground. Hold the weights in each hand and raise them with straight arms up behind you. Squeeze your shoulder blades together as you raise the weights. Pause and lower the weights. Upright rows are performed using light barbells, although two dumbbells could be substituted as well. They work the anterior and lateral deltoids, as well as your traps. Stand upright with your feet hip-distance apart and your knees slightly bent. Hold the barbell lightly in front of you with your arms straight. Bend your elbows to raise the weight up to shoulder level. Isotonic exercises are a great way to improve the strength in your shoulders. Be sure to perform each of the exercises to get the full benefit of having worked each section of the shoulder. Add isotonic shoulder exercises to your regular exercise routine and reap all the benefits this effective form of strength training has to offer.